Cast: Jodie Foster, Peter Sarsgaard, Sean Bean, Erika Christensen. Story: A newly bereaved mother loses her kid on a plane. Flightplan is the long-trailered thriller in which Jodie Foster loses her little girl within the confines of a jumbo jet. No-one's seen the girl. Was she ever there? Is Jodie bonkers? Is there going to be a satisfactory conclusion? Not likely. Flight attendants have apparently been whingeing about Flightplan and trying to get it banned because it portrays them as uncaring and unprofessional. For heaven's sake, show me a movie that doesn't paint someone in a bad light. The problem with the movie isn't its unsympathetic presentation of flight attendants (which is far less severe than it was made out to be), the problem is with the silly plot and shallow central performance. Let's start with the silly plot. A movie with a premise such as this needs to build the viewer to a level where they can't see a feasible explanation and then deliver one that was staring us in the face the whole time. 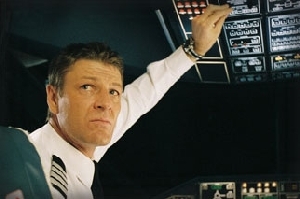 Boy, does Flightplan fail on that score. The end result has more holes than a Scotsman's underpants and, in fact, most viewers will have already dismissed it as an impossibility because of all the earlier details that contradict it. What on earth are scriptwriters paid for these days if this is the best they can come up with? Secondly, the lead performance by Jodie Foster. It's not bad, it's just rather one-dimensional. She's frantic from the word go, even before anything happens - and it's understandable given the opening news, but she just stays there for the whole movie, with that intense, internally wobbly expression. It is effective enough in its own way, but because there is no discernible increase in wobbliness, we don't feel the sense of escalating tension that we should. By the one hour mark, we become a little tired of Jodie running around the plane - which seems to be the size of a hotel - and so we're less sympathetic when the plot desiccates. Even with its relatively short running time, it still feels too long. However, despite its flaws, the underlying film-making skills are of high quality and this goes a long way to making up the deficit. Flightplan is a well-made movie with a poorly thought out story and a less than perfect lead. It's good enough to pass muster for an evening's viewing, but it's not worth missing your flight for. It sure as hell won't be playing on the plane. To enjoy this film you should be: unquestioning. Flightplan is released in the UK on 25th November.